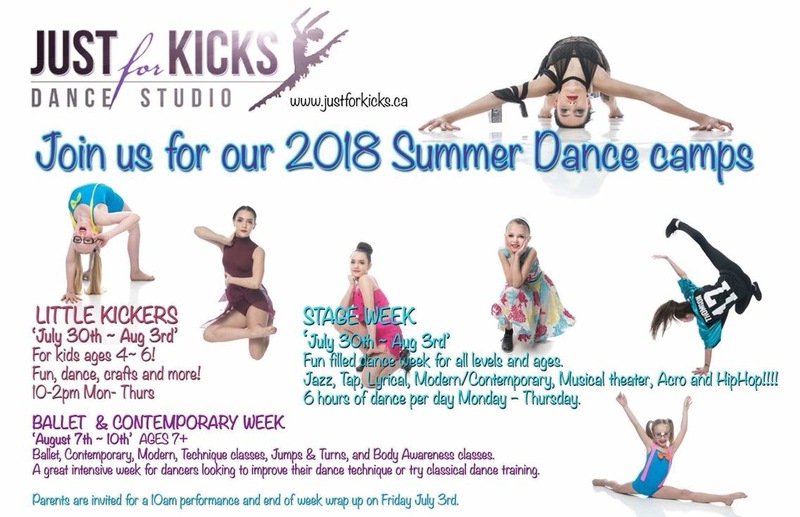 Salmon Arm July 30th – Aug 3rd STAGE WEEK Fun filled dance week for all levels and ages. Dancers will take classes in Jazz, Tap, Lyrical, Modern/Contemporary, Musical theater, Acro and HipHop!!!! 6 hours of dance a day Monday – Thursday. Parents are invited for a 10am performance and end of week wrap up on Friday July 3rd. 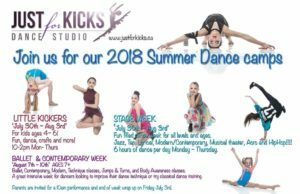 Dancers ages 7 and up will be separated into Junior, Intermediate and Senior levels. LITTLE KICKERS– SALMON ARM July 30th – Aug 3rd For kids ages 4-6! Fun, dance, crafts and more! 10-2pm Mon- Thurs Parents are invited to join us at 10am on Friday for a wrap up and showcase $150.00 for the week! August 7th – 10th AGES 7+ BALLET & CONTEMPORARY WEEK SALMON ARM! Ballet, Contemporary, Modern, Technique classes, Jumps & Turns, and Body Awareness classes. 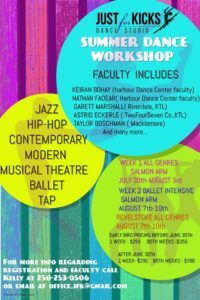 A great intensive week for dancers looking to improve their dance technique or try classical dance training. Awards & Scholarships to be won! Amazing Faculty and Guest Instructors for all 3 camps!